Climax CR-25 Robotic Case Packers achieve packaging efficiencies through a compact footprint, ease of operation and flexible packing patterns. Contact us today to learn more about using robotic case packers for your business. Carbon steel construction with a two-part stainless steel epoxy paint primer and finish coat is standard for Climax equipment. 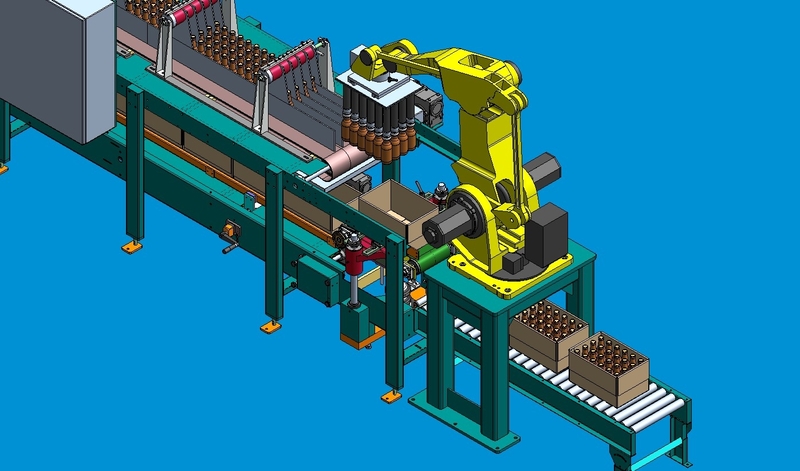 The Robotic Case Packer is designed to be as TOOL-LESS in operation as is possible. Hand cranks, twist knobs, hand ratchets, and twist-lock handles have been implemented wherever they are feasible without jeopardizing the integrity or operation of the equipment. Product infeed conveyor with THREE (3) low friction, plastic flat-top chains or mat top chain. Stainless steel, adjustable lane guides for packing up to FOUR lanes wide. Stainless steel drip pan underneath the entire length of the bottle conveyor to contain any product spillage that might take place from damaged or loosely capped bottles. The width between each lane guide is basically determined by the bottle diameter and is established by a series or lock nuts or by the optional quick-adjust lane spacers that are hung across the lane guide support crowns. If chosen, the number of sets required is outlined in the CHANGE PARTS section of this proposal. Bottle stop system to stop bottles as they move forward into robot pick-up zone. Bottle stop drops out of the way once the pick-up tooling is seated on the bottles, and returns to stopping position once the bottles are clear of the pick-up area. 1 HP variable speed A/C motor drive for the conveyor. Case conveyor system will extend underneath the Robotic Case Packer, and includes an adjustable case clamp and indexing mechanism. Quick-adjust case guide rails — A smooth operating hand crank adjusts the case/tray guiderails in the packing area of the tray conveyor for different size trays. Includes a digital counter that provides a “memory setting” for each tray. In order to detect the presence of filled cases that have stopped downstream from the Climax packer, a sensor is provided that should be installed on the discharge case conveyor of Sunny Delight Beverages Co. If cases back up and the sensor is blocked, a signal will be sent back to the packer which will pause the packer’s operation until the sensor is no longer blocked. NEMA 12 electrical package — wired for 460 or 230 VAC, 60 HZ, 3 PH. PLC Controls — Allen-Bradley is the standard for Climax. PanelView Component 400 HMI — diagnostic operator station to provide operational capabilities as well as case count and cases per minute information. Using a password, operational parameters can also be set using the HMI. HMI, push buttons for E-stop, E-stop reset, and cycle start will be mounted on the safety cage. An additional E-Stop will be located inside the safety cage near the robot. An operation and maintenance manual included.